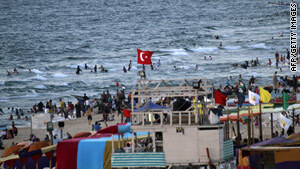 Palestinians gather on the beach in Gaza City about a week after an Israeli attack on a Gaza-bound aid flotilla. (CNN) -- Iran's Red Crescent Society will try to break the Israeli blockade of Gaza by sending food and medical supplies to the besieged Palestinian territory, an Iranian Foreign Ministry spokesman said Monday. Red Crescent official Abdul Rauf Adibzadeh said one shipment of relief goods will arrive in Gaza via Egypt by the end of the week, Iranian media reported. The aid group is also preparing to send two relief ships to the coast of Gaza, including a hospital ship with doctors, nurses and operating rooms and another vessel with more relief goods like food and medication, the IRNA and Mehr news agencies reported. Israel stopped a convoy of six ships trying to deliver aid to Gaza last week in defiance of an Israeli blockade, killing at least nine people in the course of boarding one of the vessels. Adibzadeh said there is a possibility that Iranian Red Crescent ships may be attacked but added that, despite the danger, if the Iranian authorities approve, the shipments will be sent to Gaza. Foreign Ministry spokesman Ramin Mehmanparast said the Iranian ships will be part of a new aid flotilla organized by several Islamic countries, though he declined to say which countries are involved. He called it "strictly a humanitarian effort for the people of Gaza." "We are preparing two ships to head for Gaza that will provide humanitarian aid," Mehmanparast said. "Their departure depends on how soon we coordinate with other countries that are also sending aid ships. The process of organizing the operation is under way." Separately, a "Jewish boat" is planning to try to reach Gaza, two pro-Palestinian European Jewish groups announced Monday. "Our purpose is to call an end to the siege of Gaza, to this illegal collective punishment of the whole civilian population," Edith Lutz said on behalf of European Jews for a Just Peace in the Near East and Jews for Justice for Palestinians. The group is not saying when the boat is sailing or where it is leaving from "in order to avoid sabotage," Lutz said. Israeli commandos intercepted the first convoy at sea May 31 and stormed the largest vessel, the Turkish-flagged Mavi Marmara. The ships were carrying humanitarian aid to Gaza, organizers said. The Palestinian territory has been blockaded by Israel since its takeover by the Islamic movement Hamas in 2007. The deadly raid sparked international condemnation. U.S. Vice President Joe Biden avoided mentioning the issue directly when he spoke after meeting with Egyptian President Hosni Mubarak in Egypt on Monday. He said that the present situation "is unsustainable for all sides" and that the Israelis and Palestinians needed to "move to direct negotiations as soon as possible that will result in an end to the occupation that began in 1967 and to a two-state solution to the conflict with Israel and a Palestinian state living in peace and security."